(Bridgewater, N.J., Feb. 5, 2018) - The Somerset Patriots have signed 2017 All-Star right-handed pitcher Cory Riordan for the 2018 season. His rights were originally acquired in November through the Bridgeport Bluefish Dispersal Draft. Riordan enters his first season with the Somerset Patriots and third in the Atlantic League. He played with the Bluefish in 2015 and 2017; the latter season in which he was named an All-Star. The Fordham University alumnus carried a 7-3 record with a 3.29 ERA and 88 strikeouts against just 11 walks over 93 innings pitched in his 14 starts with Bridgeport last year. Riordan’s contract was purchased by the Fubon Guardians (CPBL) shortly after the All-Star Game, where he finished the season. 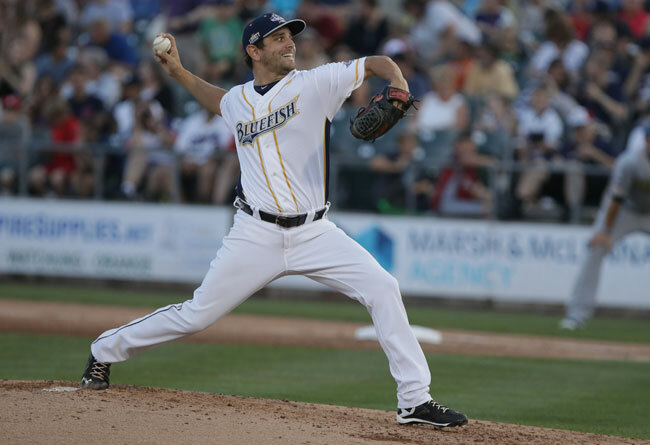 The Killingworth, Connecticut native went a combined 5-6 with a 3.62 ERA over 18 appearances (17 starts) over two separate stints with the Bluefish in 2015. He parlayed that success into a season in the Detroit Tigers organization in 2016. There, he recorded six wins over 27 appearances (24 starts) split between Double-A Erie and Triple-A Toledo. Riordan holds a 12-9 record with a 3.47 ERA and 170 strikeouts to 33 walks over 210 innings pitched in his two seasons in the Atlantic League. Riordan spent the first seven years of his professional career in the Colorado Rockies organization, including stints at the Triple-A level in 2011-13. The former sixth-round draft pick holds a 61-66 record with a 4.31 ERA over 10 minor league seasons stateside.